Oil on canvas, 460 x 510mm,18 x 30"
Plymouth Sound, Breakwater and The Mewsone from Mount Edgecumbe. with a very similar signature his work can be distinguished by the use of more vivid colours. 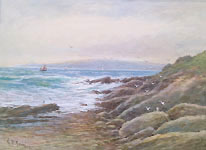 He exhibited at the Society of Western Artists, Plymouth Arts Club and at the RWA in Bristol. at the Elands Gallery in Exeter in 1907. Raphael Tuck in the Picturesque Devon series.